The Rusty Dusty is a new hard cover book of nearly 400 pages, 70 maps, and 98 photographs that presents a comprehensive look at the Great Northern's Wenatchee-Oroville branch in Washington State. The book is intended for general readers, historians, and rail fans interested in exploring the fascinating history of how GN's westward expansion substantially influenced the history and economy of the Pacific Northwest. For readers interested in the W-O line specifically, it includes construction and operational detail, with numerous maps and photographs that capture the history of this significant line, which enabled and supported the success of the tree fruit industry that literally feeds the nation. The geographic scope extends from the Canadian Continental Divide and Whitefish, Montana, on the east, to Portland, Seattle, and Vancouver, BC, on the west, with emphasis on the territory between Wenatchee and Oroville. The book explores the relationship of the W–O to subjects and issues seldom included in other railroad books. The Rusty Dusty lays the historical and geographical groundwork for the W-O line beginning with a summary of James J. Hill’s expansion strategy west of Devils Lake, ND. It then describes the construction of the W-O line and the economy of the territory it served. 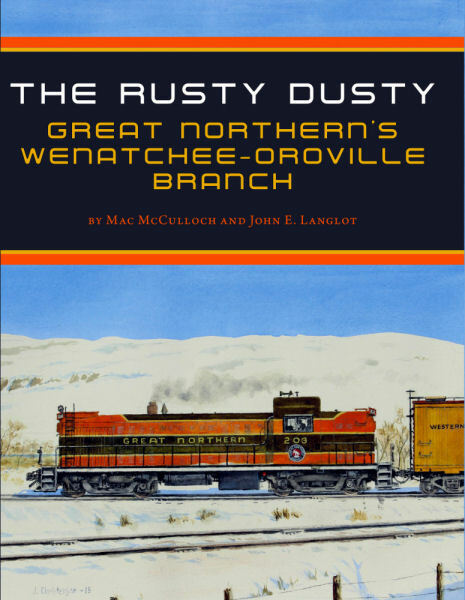 Authors John Langlot and Mac McCulloch, who combined have more than 50 years of service with Great Northern and its successors, are uniquely qualified to examine and interpret the Great Northern's remarkable history in Eastern Washington. They describe what it was like to work on the Wenatchee–Oroville branch. They tell the working railroad man’s story using materials from long time W–O conductor Orval Dungan and the living memories of co-author John Langlot, who worked the W–O as a brakeman in the 1960s. The authors illustrate the effort and determination of the men who made the Great Northern function, and hope to stand approved by those remaining few who experienced and understand its operations. Hard cover.